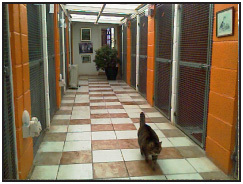 Cattery - Woodfarm Kennels and Cattery are based in Sedgley (near to Wolverhampton, Stourbridge, Walsall and Dudley), providing high quality boarding accommodation for your pets (Cats & Dogs) whilst you are enjoying your holidays. Your cat will enjoy spacious individual cat cabins that are heated during the winter months. Access to all cabins is via an escape proof passageway. There are ten large family cabins with inter-connecting doors, ideal for separation during feeding times, ensuring that all get their own food. All cabins have a raised sleeping area, scratching post, climbing frame and a small armchair for your cats to lounge about in. All cats should have an up to date vaccination for feline enteritis and feline influenza, we also recommend vaccinations against feline leukemia. You are welcome to bring your cat's personal bed, toys, etc, this helps to keep your cat in touch with its home comforts, your blanket draped over our armchair “what a luxury”. Your cat will also receive individual attention with lots of cuddles. Our strength lies in providing professional care and supervision guaranteed, compliant with (CIEH) standards, licensed and approved by South Staffs Council. Woodfarm Cattery has a wide range of well know brand foods available, catering for fussy eaters and special diets.